Today am with a Malabar special drink for Ramadan, especially during iftar. It is very hard for Muslims when Ramadan falls in summer. To avoid dehydration, we must drinks lots of water and fruit juice after Iftar until suhoor. This semolina drink is popularly known as Thari kanji in Malabar. But as the name implies, this drink is not a kanji (gruel). It is a sweet semolina drink which is served hot to break the fast. It is prepared not only during Ramadan but also prepared during special occasions or served as a kheer/payasam. Roasted semolina, roasted vermicelli, and coconut milk are the main ingredients in this kheer recipe. As we all know that semolina is very easy to digest, it is good to break the fast with this hot sweet drink. This drink/kanji is a good choice when served during iftar which helps to settle the stomach quickly. Kids will love this kheer recipe for sure, no doubt. Adding few teaspoons of roasted thin vermicelli in this drink gives a special feel while drinking. But it is very important to note that, do not ever add too much of vermicelli or semolina that required. It makes the kheer thicker. This thari kanji/semolina drink tastes really awesome when it has a thin consistency. I have already shared thari kanji recipe with milk (cow's milk) on my blog. But as thari kanji is traditionally prepared using coconut milk, I would like to share that recipe too on my blog. 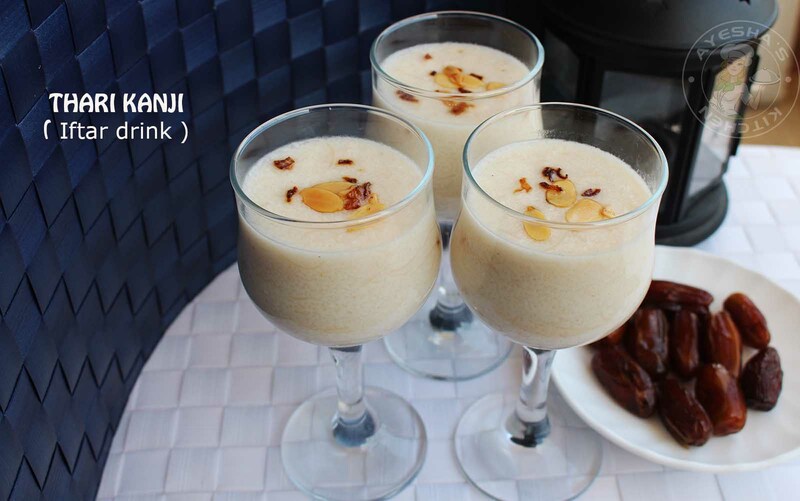 Many of my readers requested me to share this semolina drink recipe with coconut milk as some are allergic to cow's milk. 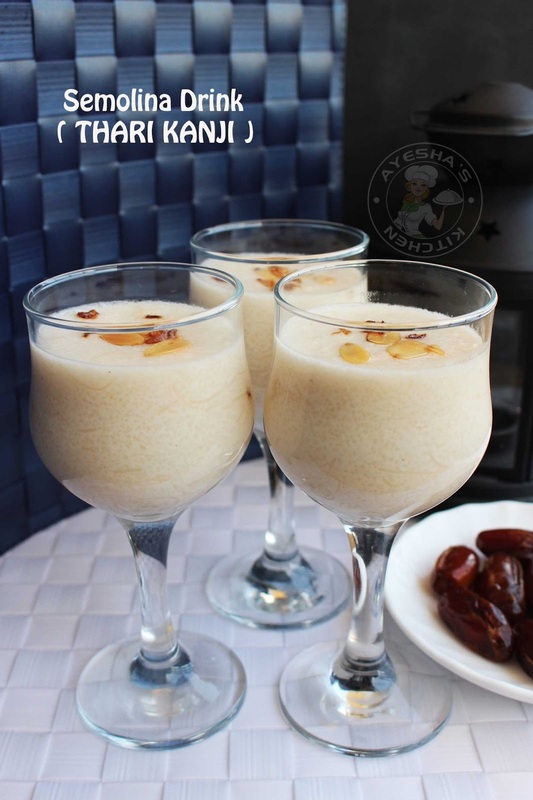 Hope this semolina kheer or semolina drink or rawa payasam is a healthy drink during Ramadan. 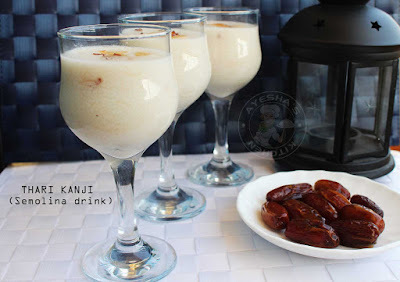 So here is the recipe showing how to make thari kanji recipe/semolina drink / iftar drinks / rawa payasam / semolina payasam / semolina kheer / party drinks / sweet desserts. Heat a pan with 1 tsp of ghee and roast the semolina for a couple of minutes or until a fine aroma come out, over a medium low flame. Transfer it to a bowl and set it aside. Now set aside thick coconut milk and thin coconut milk ready. ( Check below notes showing how to extract thick coconut milk and thin coconut milk ). Bring to boil two cups of thin coconut milk in a vessel. To this, add crushed cardamom and salt. Mix well. Then add roasted semolina and allow it to cook for 2 minutes. Stir occasionally. To this, add roasted vermicelli and mix well. Then add sugar, again mix well. When the vermicelli and semolina are done, add the thick coconut milk. Cook for a minute or two but do not let it to boil after adding thick coconut milk. Stir well. Check for sugar and salt. Remove from flame. Now heat a pan with 1 tbsp of ghee. Fry chopped shallots and sliced cashews until golden. Pour this over the prepared thari kanji or semolina kheer. The drink will become slightly thick once cooled. So, while serving add half a cup of hot water if required. Set aside the thick milk. Squeeze and strain it to a bowl.